Good to see George (Johnny) Johnson looking so well! 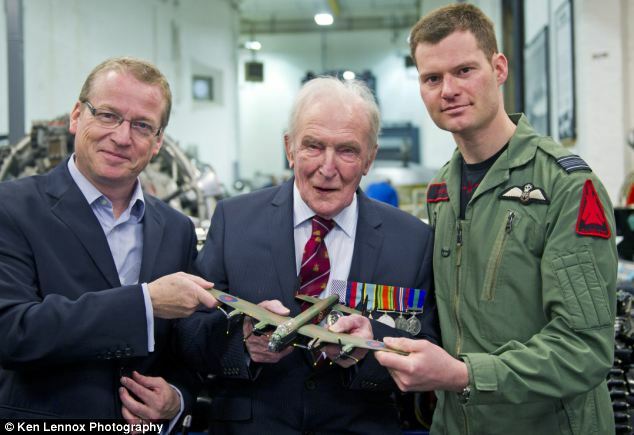 The last British Dambuster was at Filton in Gloucestershire to meet Simon Dufton, organiser of next month’s charity motorbike run to the Möhne Dam, and current 617 Squadron pilot Tom Hill. Full story in the Daily Mail. Simon is making good progress towards his fundraising target. If you want to sponsor him, his details are here. This guy gets about a bit. My mum met him near Louth, Lincs in March, when he asked her for directions to a local address1 Very small world. Very polite gentleman, and very modest when she enquired as to what he did in conversation with my mum. To say she was sunned into silence when she found out who he was (says a lot for her too) was an understatement!! I was wondering if anyone could tell me if johhny has any family conections in scotland and if so how would i be able to find out more. We’ve just got back from Shoreham Airshow where we met this lovely man. A gentleman in every sense of the word and at 92 still smiling and giving the RAF his time. He wrote a lovely personal autograph for my 10 year old and one for his best friend too and nothing was too much trouble including posing for individual photos with them. By the way, the Airshow was spectacular. Being a bit of girl, I don’t relish being dragged along to boys’ events (planes, cars speeding round tracks and the like),with husband and son, but this event was well worth it. The higlights for us were George (Johnny) Johnson and the RAF Falcon parachute team, who had so much time for the boys, signing a special brochure for them and posing for photos. Plus all the aerial displays of course: The Typhoon (or The Typhoid??! as my son called it),was breathtaking. Forget a theme park, (and I’ve been to loads), this is a great day out. Loads of fun/ loads to do, relaxed and a tribute to those to whom we owe so much. Fabulous.